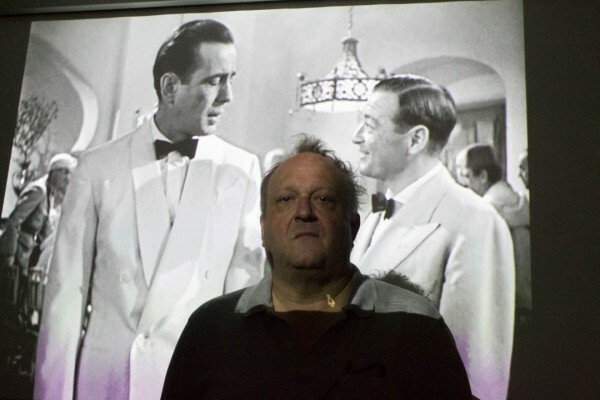 Ken Windrum stands in front of the projector showing “Casablanca” in the VILGE 8300 at Pierce College in Woodland Hills, Calif. on Monday, Oct. 5, 2015. Windrum shows this film in his introduction to screenwriting class. It’s a moment he’ll never forget. Sitting in the front row watching “2001: A Space Odyssey,” a budding film fanatic knew that movies would play a major role in his life. Today Ken Windrum is a full time assistant professor of cinema at Pierce College. He has been teaching at the school since 1998. It wasn’t only the sci-fi classic that he loved growing up. Windrum’s dad took him to see “Lawrence of Arabia” as part of a double feature. His love for films first made him want to be a director. He wanted to be the guy behind the scenes and display his creativity on the big screen. Windrum began to study a lot of the technical aspects of the business, such as filming on 16 millimeter, during his undergraduate program at the University of California, Los Angeles. He then began to realize that the critical studies classes were what really drew his attention and excited him. During his undergraduate education, Windrum wrote and directed a melodrama set in Los Angeles about a woman on the verge of a nervous breakdown. Windrum recalls that his earliest project contained film elements that are very typical of a first-time director. Windrum believes that teaching the theory and history of film is just as important as participating in the industry. He encourages his students to make connections while they’re in school. He wants them to realize that it is not always what you know, but who you know. Windrum is also currently revising his doctoral dissertation on American movies of the late 60’s and early 70’s. It is taking a bit longer to write, he said, because he is busy teaching five classes at Pierce. Windrum enjoys melodramas and thinks that Hollywood doesn’t know how to make them anymore. He believes the 1940’s were a great time for melodramas. Windrum, who is a fan of classical filmmaking, believes that film is missing a lot in today’s industry. He also appreciates modern day directors as well. Quentin Tarantino, Martin Scorsese and David Cronenberg are among his favorites. “I don’t understand why directors today have to use so many close ups and edit so quickly,” Windrum said. The reason they shoot so many close ups, Windrum said, is because they’re cutting so quickly. He recently saw “Black Mass,” starring Johnny Depp, earlier this week and thought that it was dull and boring. He went on to talk about Michael Bay and how he tries to have as many shots as possible from as many different angles, thinking it looks “cool”.